If you're looking for truly unique wedding jewelry, a mokume gane wedding band could be a great choice. This ancient Japanese technique for mixing metals creates rings with a distinctive wood-grain pattern that will turn heads for years to come. Since mokume gane is such a specialized jewelry technique, you may have difficulty finding one of these amazing wedding bands or engagement rings at your local jewelry store. Some artisan jewelers may offer mokume gane pieces, but you'll find the best selection if you shop online. The following Internet jewelry stores offer many wonderful options. James Binnion Metal Arts has a wide variety of mokume gane wedding and engagement rings. Most pieces are custom made, and there are numerous choices for materials, colors and shapes, allowing you to choose your dream ring. According to reviews on WeddingWire, shopping at James Binnion Metal Arts is a great experience. Reviewers praised both the excellent customer service and exceptionally beautiful rings. Unique Palladium Engagement Ring - Crafted of palladium 500 and sterling silver, this incredible, four-millimeter-wide ring has a graceful wood-grain pattern and a branch-inspired crossover prong setting. You can choose any center stone. Contact the jeweler for pricing. Classic White Gold Wedding Band - This classic, seven-millimeter-wide wedding band features a beautiful wood-grain pattern in 14k palladium white gold and sterling silver. Pricing varies by ring size and options, so contact the jeweler to find out more. Men's Platinum and Gold Wedding Ring - This gorgeous men's ring is 10.5 millimeters wide and features a swirling wood-grain pattern in platinum, gold, and sterling silver. You can also select from other metal choices. The center of the band contains flush-set diamonds. Contact James Binnion Metal Arts for pricing information. You can buy James Binnion Metal Arts rings through the website or from one of their many local stores. Andrew Nyce Designs offers several different patterns, styles, and colors of mokume gane wedding rings, engagement rings, and bridal sets. You'll also find Damascus stainless steel wedding rings, which offer a similar look at a lower price point. Reviews on WeddingWire praise the quality workmanship and lovely appearance of these rings, which are available in many different options. Glacial Mist mokume gane Wedding Ring - This exceptional ring features a beautiful pattern of 14k palladium, white gold and sterling silver. A diagonal channel displays seven round 0.0075-carat diamonds. You can choose from six and eight-millimeter widths, as well as a number of metal compositions. Pricing depends on the options selected. Glacial Mist mokume gane Diamond Engagement Ring - In this stunning ring, a 0.70-carat, princess-cut diamond is displayed on a palladium 500 and sterling silver mokume gane band. The cool colors and wood grain swirls give this ring a distinctive and beautiful appearance. Pricing depends on options. 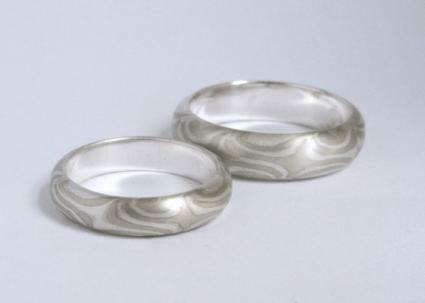 Ashes and Snow Platinum mokume gane Wedding Ring Set - This set of two matching rings, which you can also purchase individually, has a dramatic grey and silver pattern. It's constructed of platinum, 14k white gold, and sterling silver. You can choose from any width between 3.5 and 10 millimeters, and there are also many metal alternatives. Pricing depends on options. You can purchase Andrew Nyce Designs mokume gane rings online or from one of the retail locations in the United States and Canada. Chris Ploof Designs also offers a wide variety of mokume gane options for wedding and engagement jewelry. In addition to the traditional metal choices, you'll find rings featuring meteorite iron. There are no reviews of this jeweler, but all rings carry a guarantee. mokume gane Classic Setting Engagement Ring - This pretty ring features a wood grain pattern in 14k white gold and sterling silver with 14k yellow gold accents. A six-millimeter, round blue sapphire is eye-catching as the center gem. Inquire about pricing. Red Gold Birch Pattern mokume Band - the combination of 14k red gold, palladium and silver gives this wedding band a distinctive look. This wedding band is seven millimeters wide, and pricing depends on ring size. Maple Grain Yellow Gold and Meteorite mokume gane Ring - This amazing wedding band is made of 18k yellow gold and meteorite iron. It's six millimeters wide and is lined with 18k yellow gold. Pricing depends on ring size. You can buy a wedding band or engagement ring from the Chris Ploof Designs website or purchase from one of the authorized retailers. Although they don't offer mokume gane engagement rings, Amazon.com does have a variety of options for wedding bands. Most are quite affordable and include titanium, tungsten, or other less-costly materials. Some individual rings also include reviews from people who have purchased them. Copper And Silver Mokume Gane Ring, Titanium Wedding Band - This seven-millimeter-wide copper and silver ring has a wide band of mokume gane around the center. It's available in ring sizes from seven to 13.5 and retails for about $1,300. 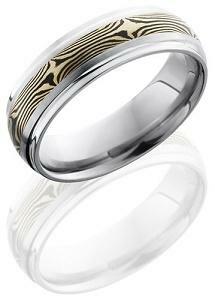 Mokume Gane Inlay Titanium Band - This attractive titanium ring has an inset of 14k white gold and Shakudo Mokume. It is seven millimeters wide and retails for about $260. You can also choose to have this ring engraved. Another option is to buy your ring directly from the artist who made it. This allows you to work with the artist to craft the ring of your dreams, as well as support someone who is trying to make a living at his or her art. Consider the following resources for finding a mokume gane artist. Contact your local college or university art department to see if they can recommend someone who specializes in the mokume gane technique. Visit Etsy.com to look at the work of the artists there. Many will create a custom piece, or you can buy the rings they have listed. There are hundreds of different options, which change all the time. Check out the selection on ArtFire, where there are many different options for mokume gane wedding bands and engagement rings. The selection changes all the time. As you shop for a mokume-gane wedding band, keep the following tips in mind. Be precise in measuring your ring size. It can be difficult to resize a mokume gane band, since there is often an obvious interruption in the pattern. If you are ordering your mokume gane ring online, have you finger sized accurately by a professional jeweler. Give some thought to materials. Certain metals, like iron, can be impractical in rings. You may not be able to get your ring wet or allow it to be exposed to certain materials. Some rings require a liner metal so they do not discolor your skin. When choosing a mokume gane ring, go for practicality as well as good looks. Consider the shape of the ring shank. Since mokume gane rings can be quite substantial, you may want to choose a comfort-fit ring with rounded edges. mokume gane rings come in a wide range of patterns and metal combinations. Learn about all the options before you choose your wedding band or engagement jewelry. No matter where you buy your mokume gane ring, you'll enjoy having wedding or engagement jewelry that stands out from the crowd. Due to the way these rings are created, they are one-of-a-kind. Many couples feel this uniqueness makes them the ideal symbol of their relationship.